Hair care : Personal care products | IBE TECHNO CO.,LTD. Beautiful flowers grow up on the strong and healthy land. So does the hair. 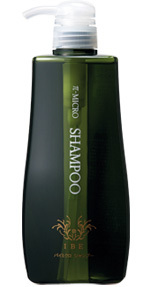 π-MICRO hair care products clean dirt and sebum that cause damages to the scalp and give moisture. With good healthy condition of the scalp, beautiful hair shall be grown. Fine foam of mild washing ingredients cleans dirt well. Surfactant is based upon natural palm oil. Natural silk ingredient, sea weeds and various plant extracts make soft and smooth touch. Wet hair well with lukewarm water and take appropriate amount on the palm, forth well and massage over the scalp with the bulb of fingers. Then wash off. 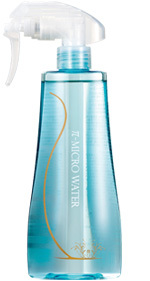 It repairs damaged hair and scalp by balancing water and protein. 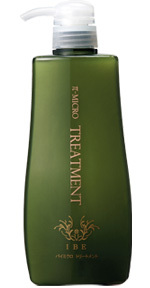 Giving the moisture to the hair, glossy firm hair will be restored. Smells of the hair and scalp will be reduced and offensive smells and stimuli of permanent liquids and colors will be reduced. Apply on the hair and scalp after shampoo. Then without rinsing it apply "TREATMENT" and rinse them together. 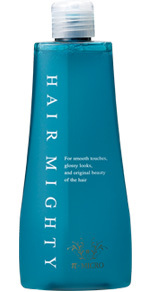 ※Special care for damaged scalp and hair : Apply "HAIR MIGHTY" on the scalp and hair before shampoo. After 5 minutes, rinse it. Intractable dirt will be easily removed. Natural silk ingredients, sea weeds, and various plants extracts give moisture to hair and keep natural glossy and smooth touch. After shampoo, apply right amount all over the hair. After a couple of minutes rinse well. It balances moisture contents of the hair and scalp. Protects the hair from ultraviolet rays, static electricity, and dryness. Glossy hair and healthy scalp will be yours. After drying with towels, spray enough to the scalp and hair. And blow-dry the hair. Spray whenever the hair is dry and loose. It repairs the hair from the scalp. Gives moisture to the scalp and hair and make smooth touch. Not only gives various precious ingredients to the hair but realizes the original beauty and potential of the scalp and hair. After drying with towels, apply proper amount to the scalp and all over the hair. Recommended amount is more than 4 times pushes for short hair. Apply little by little until the hair gets wet. For the scalp, massage with fingertips. In the morning apply the proper amount to the scalp and hair. Styling shall be easier. 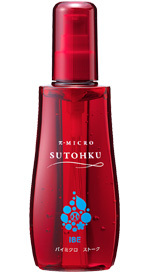 Before applying "SUTOHKU", supplying water by "π-MICRO WATER" is more effective.